Tonight is one of the best nights of the year to see a meteor as the Geminid meteor shower is predicted to reach its 2014 peak. The Geminids are one of two annual showers (the other being August’s Perseids) that are almost guaranteed to produce high rates of meteors (at least one every few minutes or better). The International Meteor Organization (IMO) maintains a “live” graph showing the rate of the Geminids as reported by visual observers around the world. This year the Geminids will be near peak intensity on Saturday night/Sunday morning, December 13/14. From a dark, moon-less sky, the Geminids have consistently produced peak rates of ~100 meteors per hour. According to the IMO, the Geminids reached ZHR rates of 134 per hour in 2013, 109 in 2012, 198 in 2011, 127 in 2010, 120 in 2009, 139 in 2008, 122 in 2007 and 115 in 2006. Note, these rates assume ideal observing circumstances that are rarely achieved. Dark sky observers may see rates that approach the ZHR values. Most of us observing under light polluted skies will see lower rates (perhaps much lower for city dwellers or observers watching before 10pm). Unlike most showers that can only be observed in the early hours of the morning, the Geminids radiant rises as early as 7 pm and a good number of meteors can be seen by 10 pm. The radiant is nearly overhead at 2 am and it still well placed for the rest of the night. This year the Last Quarter Moon (located close to a brilliant Jupiter) will hinder Geminid watching after midnight. The shower can still be observed after Moonrise though fainter meteors will be washed out. It helps to keep the Moon out of your line of sight. As the name implies, the Geminids appear to radiate from a point in the constellation of Gemini. More specifically from a point just to the north of the bright star Castor, the northern star in the Castor-Pollux pair. During the evening Geminids will be coming out of the northeast. By the middle of the night the radiant will be close to overhead and meteors will be raining down on all sides. In general it is best not to look directly at the radiant. Meteors are easier to see by looking 30 or more degrees from the radiant (for reference 10 degrees is the width of your hand at arms length). The key is to look up and regardless of where you look you should see quite a few Geminids. The night sky for December 13 at 11:00pm local time over Tucson. The Geminid radiant is shown as a yellow circle with Geminid meteors radiating away from it. 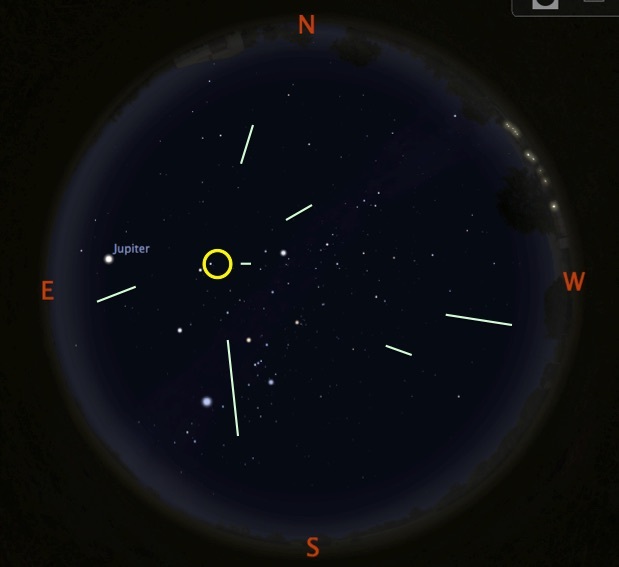 Chart produced with Stellarium. Sky brightness matters when it comes to seeing most meteors and the Geminids are no exception. As always, the darker the sky the better. If you are located in a place with pitch black skies (mountaintops, middle of the desert, national parks) rates can be as high as ~100 per hour. In rural areas near small towns rates will be a bit lower and probably in the 80-90 per hour range. In the suburbs rates will vary depending on how close to a major city you are but you should expect rates of 20-50 per hour. In a major city rates will be very low though 2-10 per hour should be seen. To increase your chance of seeing the Geminids find a spot with a clear view of the sky. Any obstructions (trees, buildings, etc.) can block some of the meteors. Also find a spot where lights (streetlights, security lights, etc.) aren’t shining in your eyes. This will allow your eyes to dark adapt and you will be able to see fainter, and more, meteors. The most important thing to remember is to get comfortable when observing. A lawn chair is perfect for reclining back and taking in the sky. Remember that it is cold this time of the year in the Northern Hemisphere so bundle up. It does not take much time, especially when relatively inactive, to start freezing. The Geminids were created by an enigmatic object named (3200) Phaethon. For starters Phaethon is an asteroid and only displayed what might be considered cometary activity for a few days in 2009. But meteor showers are created by comets and nearly all comets have orbits that carry them at least as far from the Sun as the orbit of Jupiter. Yet Phaethon only travels out to a distance of 2.4 AU, roughly half the distance to Jupiter’s orbit. Based on its orbit it is hard to call Phaethon anything but an asteroid. Image of Geminid parent body (3200) Phaethon by Jean-Baptiste Kikwaya on 2014 November 27 with the Vatican Observatory VATT 1.8-m.
3) Phaethon is an asteroid that broke up in the past. There is evidence to suggest that Phaethon is just the largest piece of a ancient break-up. In fact, two additional asteroids that may once have been a part of Phaethon have been found, (155140) 2005 UD and 1999 YC. According to Peter Jennisken’s book “Meteor Showers and Their Parent Comets”, the Geminids can be explained by the break-up of Phaethon just after perihelion many orbits ago. Since Phaethon gets to within 0.14 AU (14% of the Earth-Sun distance), perhaps it split from the stress of intense solar heating. BTW, this scenario does not rule out Phaethon as a ice-rich Main-Belt comet. The recent discovery of additional asteroids related to Phaethon points to scenario 3 as the most likely origin of the Geminids. If true, the Geminids were not the result of long-term cometary activity like most meteor showers but were created in a discrete event or events when Phaethon split or shed smaller pieces. The Daytime Sextentids and perhaps the very minor Canis Minorids were created by even older break-up events. Though Phaethon has behaved like an asteroid since its discovery in 1983 it has been observed to ‘burp’. 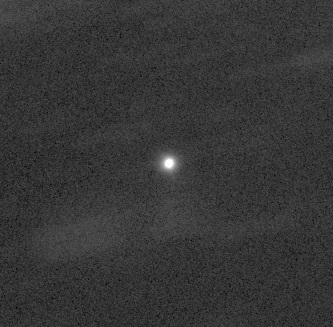 Near its perihelion, the asteroid is sometimes visible in near-Sun images taken with the STEREO spacecraft and occasionally appears to elongate as if it had a short tail and brighten. Analysis by David Jewitt and Jing Li (UCLA) found that Phaethon did release some surface particles. Due to intense heating (perihelion is 0.14 AU from the Sun or 7 times closer than the Earth is) some of the rocks on the surface may have fractured producing a cloud of dust which was knocked off the surface by solar radiation pressure. In effect, it is a rock comet. Still this event was very short-lived and produced a minimal amount of debris. So these type of events should not have been large enough to create the Geminids by themselves. I penned a guest post on Phaethon for Dr. Dante Lauretta (PI of NASA’s OSIRIS-REx asteroid sample return mission) back in 2013. You can read it here. Whether Phaeton is a traditional comet, a volatile-rich asteroid, an asteroid that split into pieces, or a ‘rock comet’, the result is going to be one of the best astronomical shows of the year. So go out and enjoy the show!